If you want to let someone know you love them, make a roast. It’s a simple dish, but done right it can be one of the most wonderful things you ever put in your mouth. Roast is not complex or temperamental. It can be garlic pierced, seared on all sides, bathed in browned onions and carrots, and left simmering for hours upon hours. It needs a little love. It needs a little attention. And then, you need to give it some private time. No peeking, there is magic going on under the lid! You might as well put a “Do Not Disturb” sign on your pot. But oh how the wait is worth it. Now, make sure you are alone whenever you open the lid. You are about to experience the aroma of heaven. Slowly take the lid off and breathe in deep. Take a moment. It’s worth it. Go ahead. I won’t tell anyone. 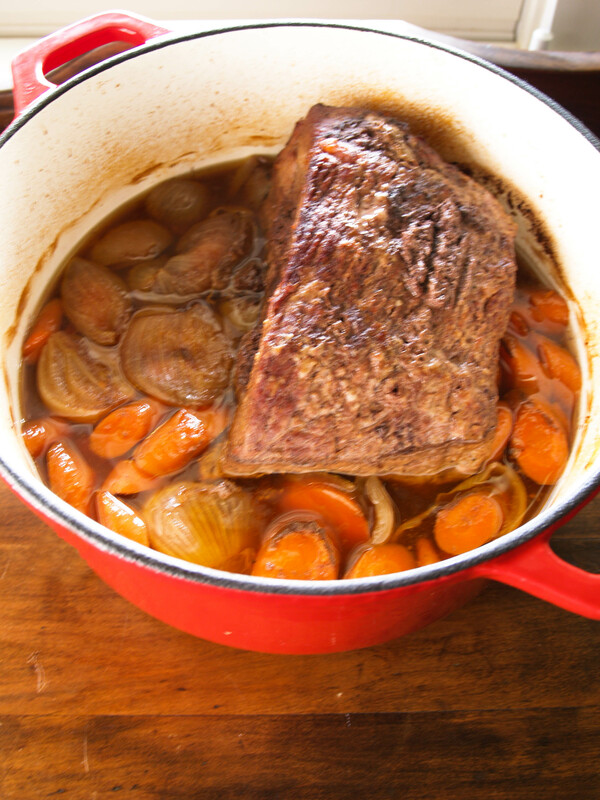 In the pot, you will discover the most buttery, flavorful meat. Roast gives back when treated well. It’s Southern hospitality on a plate. Heat a large pot on medium high heat. Add about 2 Tbs. canola oil. Place onions in the pot and cook until brown. Take the onions out and add carrots. Cook just until brown and take carrots out of pot. Pierce meat and add garlic cloves in the holes of the meat. Season with salt, pepper and Tony’s Chachere’s. Dust with flour. Place in the pot and sear each side until brown. Add vegetables and beef stock. Place the lid on the pot and place into the oven for 4-5 hours. Take roast out and add butter to the cooking liquid. Stir to combine. Sounds very familiar, I can vouch for the wonderful taste! After all I’m from Eunice ,la, This dish is a must for Sunday dinner with potatoes and carrots and mom and dad and brothers and sisters and granny and papa!!!!!!!! Sounds very familiar,I can vouch for the taste! After all I’m from Eunice,la. This dish is a must for Sunday dinner with potatoes and carrots and mom and dad and brothers and sisters and granny and papa and aunt Shelva and uncle Harvey’!!!!!! This is the best meal I have ever put in my mouth! A bunch of high fives all around! This is gone by the end of the night, so I can never get thirds 🙁 but nevertheless! It’s a nice dish! It makes me happy and smile and joyous and laugh and eat and eat and eat! Seriously the best dish! !